With Windows 8 it seems just a bit difficult to simply shut down your computer. Unlike previous versions of Windows, you can no longer just click Start and then proceed to shut down your PC. Instead, Windows 8 makes you take the scenic route and either go through the process of logging off or flipping through the Charms menu, diving into Settings then pressing power and finally clicking Shutdown. Super intuitive right? Well, there is an easy way to get around all of this and quickly shut down your PC. Once the shortcut is created you can change the icon of the shortcut to something a little more interesting by right-clicking the shortcut, selecting Properties, and then under the “Shortcut” tab, click Change Icon. Now you can shutdown Windows 8 in record time! Let’s go a little deeper into what we’re asking the system to do when creating our new shortcut. When we type “shutdown” we are simply asking the system to execute the shutdown.exe file located in the Windows System32 folder. The “/s” lets the shutdown.exe program know that we intend to shutdown our computer. 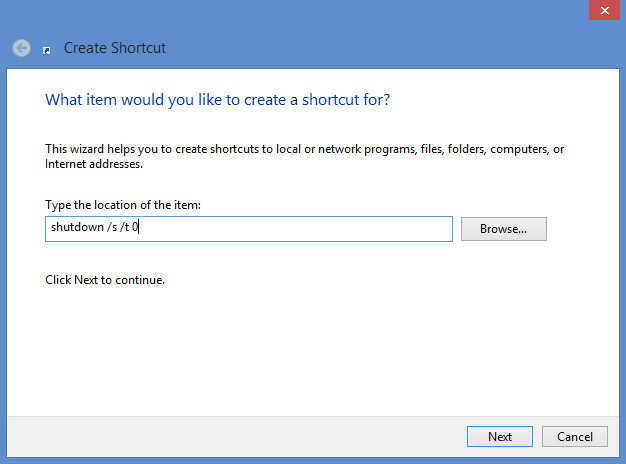 I know it seems redundant but there are a bunch of other options (sometimes referred to as flags or switches) that the shutdown.exe program can perform including restarting the computer after it shuts down (/r). The “/t” lets the shutdown program know that we are about to tell it the time-out period we wish to use for this shutdown, which is then followed by the actual time-out period we want, in this case we used “0”. For a full list of options to use with shutdown.exe, you can simply type “shutdown ?” in your command prompt or power shell.